Make it easy for athletes & parents to find your organization. The SportsEngine.com website is a powerful, user-friendly, sports search engine. It allows anyone to search for and see a list of sports teams in their area, detailed organization descriptions, program information, and more. This, of course, includes all the teams hosted by TeamUnify since SportsEngine is our parent company. 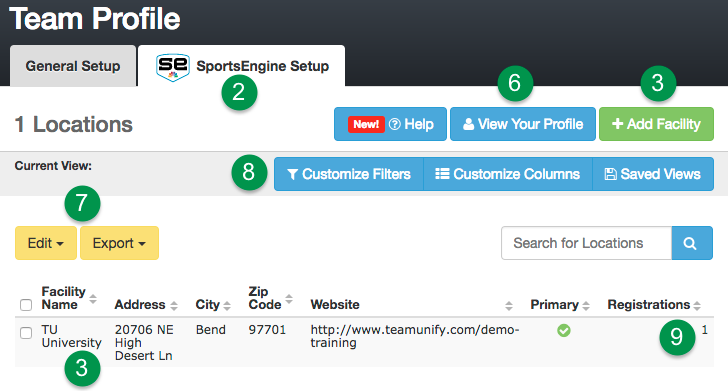 To update your team in this youth sports directory, you simply need to edit it on the SportsEngine Setup page in SwimOffice. 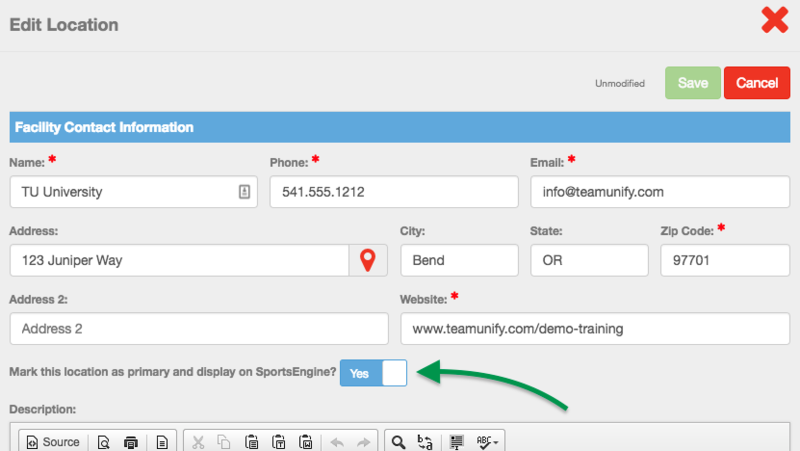 Click the SportsEngine Setup tab. Add or edit a profile. Click + Add Facility to add another location if you have multiple locations. Click the name of an existing location to edit. Fill in or edit the fields. Make sure to gear your information toward those looking for a team to join, especially in the Description editor. Currently, only your primary location will show in the directory's search results. Set Mark this location as primary and display on SportsEngine? to Yes if you want this location to be featured in the directory. Future revisions will allow multiple locations to be included. The content in the Description editor will be displayed as plain text, so don't worry about adding images, hyperlinks, or formatting such as bold. For your initial primary location, we pull the Admin Contact Information from the oldest entry in Member Feedback Email Recipients, so please make sure it is who you want to have listed. Click View Your Profile to see what it looks like in the SportsEngine youth sports directory. Click the checkbox by one or more locations, then click Edit to either Edit or Delete them, or click Export > Custom Export Excel for a spreadsheet of all the location's data. Customize what you see on the screen. Customize Filters lets you narrow down the information displayed. Customize Columns lets you select which columns of information to include on the screen. Saved Views lets you save your filter and column selections, then restore any of your saved views to instantly display data the way you like. Indicates the number of registrations displayed on sportsengine.com for the location.